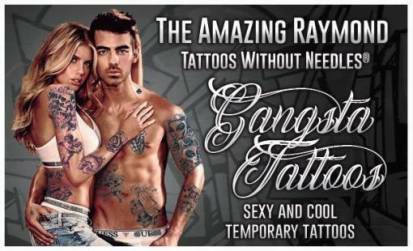 Our Temporary Tattoos Fun Cards, Tattoo Papers and Inks-Comply with Australian Standards AS/NZS ISO 8124.3:2003. The application process is so simply and fast that even school kids can apply and make excellent money at the event. Perfect for birthday parties, fetes, festivals and fundraising. Our Hi Tech Stick On Type Temporary Tattoos look fabulous on the skin, are Easy, Fast, Safe and Simple to Apply, affordable and FDA Compliant. Applied with water and sponge, they can last up to a week on the skin and can be Instantly removed with any perfume or Baby Oil.